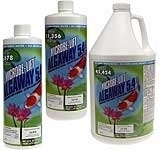 GreenClean EPA registered algaecide is made by BioSafe Systems. GreenClean Granular and Tablets works on contact to control algae in water gardens, ornamental ponds, fountains, and other water features. Through its patented formula, GreenClean immediately begins fighting algae blooms, releasing vital oxygen into the water body as it biodegrades. GreenClean also quickly eliminates algae on a wide variety of surfaces such as fountains, birdbaths, statues, and walkways. You will see results in 24 hours. The granular form is best for targeting waterfalls and the sides of ponds.and waterfalls.Turn off circulation and apply GreenClean granules directly to problem areas. Turn circulation back on after 10-20 minutes. 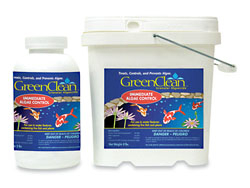 For pond clean outs: Apply granules directly to rocks, then rinse clean. GreenClean comes ready to use - Homeowners can enjoy their water features without all the guesswork or complicated directions. And the best part is, GreenClean begins working within 60 seconds of application. Safe for fish and other animals. Always follow the manufacturer's recommended dosage. The granuals can be dangerous to birds if ingested but once it is activated in water it is then safe for birds.